was in the grounds of Brodie Castle. 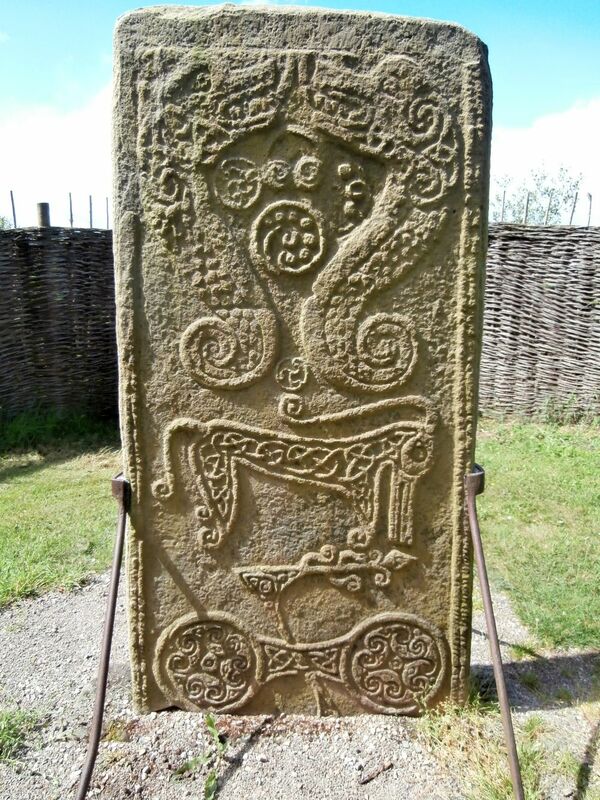 This is the Rodney stone and it is protected by a screen of woven branches, is around six feet tall and again has Christian carving on one side but on the other beautiful Pictish symbols. A third stone, the Kebbuck stone, with hardly any visible markings, is just outside a small cottage in woodland. All three we saw in one day. A feast of stones came on a different day when we walked round the Clava Cairns near Culloden. These stones are much older, dating from around 2000 BC. These were built by Bronze Age people and it is thought that they formed a part of a large cemetery. There are chambered cairns surrounded by kerb stones and boulders and stone circles arranged very carefully according to type, size and colour of stones. The setting sun at the winter equinox shone directly down the entrance to the chambers. They are managed by Historic Scotland and, apart from the information notices and tidy car park, they are open to the elements and free to visit. Well worth coming to. others, however different and receiving from them – which indeed we did a day after when a Good Samaritan – Kris, stopped is rather swish car on the roadside as we were tramping along, already having walked 12 miles and finding we were stranded as no bus had appeared to return us to our accommodation. Thank you Kris – a Christ-bearer indeed! 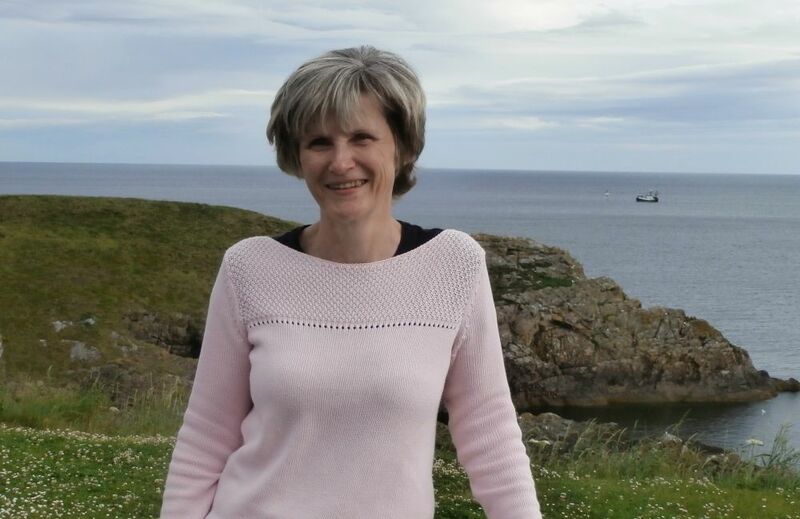 More thanks and hellos must go this week to David – our host for the week at Rannoch cottage, to Shelagh (hope you eventually managed to get to work at Fort George? ), Catriona whom we met on the cycle track near Forres and Bob Macdougall who is training for the Scottish 500 with his friend Davie. Hope you have as much encouragement as we have had. And finally – we have made it to the Kessock Bridge. We got there through a rainy Industrial Estate and linked up with where we had climbed the steps to cross the bridge on our Lands End to John o’Groats walk back in 2011. (See the LEJOG tab on the website). It has been great fun, good walking and although we are five years older (and sometimes have felt about ten years older than then) we have really enjoyed it. Author NancyPosted on July 8, 2016 January 20, 2017 Categories Firth to FirthLeave a comment on A Stone, another stone, more stones and the Kessock Bridge! We have been enjoying the scenery of this Moray Coastline very much. The weather has been heavy showers and sunny intervals which has kept us on our toes and although we have got used to the day after day walking, our muscles are sometimes begging us for a rest. 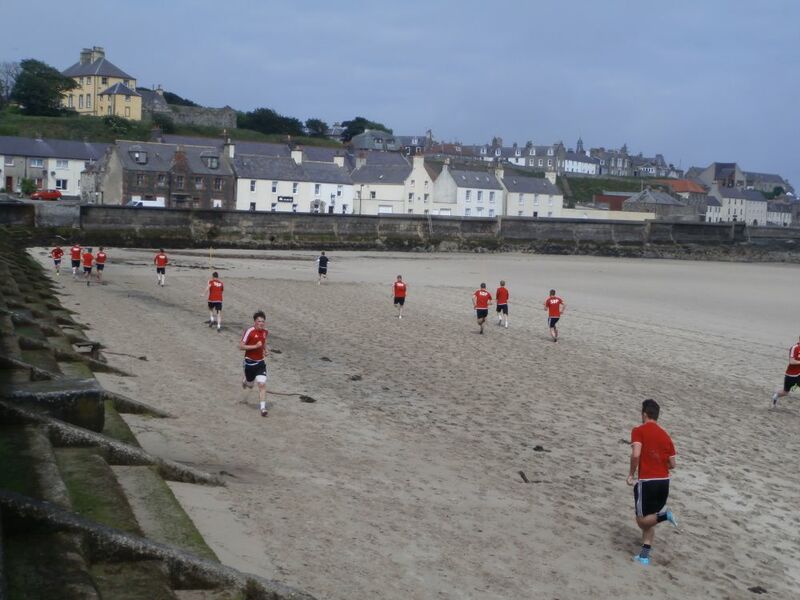 However, in Banff we were put to shame when we saw a football team out training on the soft sand. They jogged backwards and forwards on about a 100 yard sretch with every now and then the coach telling them to sprint. It made me tired to watch! 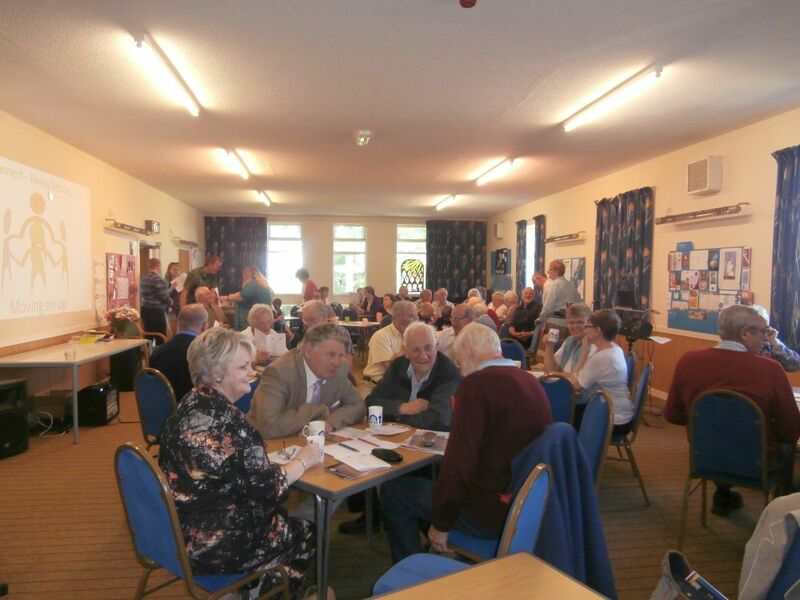 Last Sunday we received a warm welcome from the church of St Andrew at Lhanbryde and Urquhart. They were having a special ‘café’ style service to mark the moving on of some of their children who were either starting school in September or moving to a new school. The service was led by Grant and themed upon St Paul’s letter urging his fellow Christians to run so that they completed the race. It included some thought provoking clips from the Olympics as well as some thought provoking questions. We enjoyed it very much. Thank you all. The coastal scenery has included some dramatic cliffs and caves, with some equally dramatic climbing and descending. After a particularly stiff scramble we came across the Cullen pets’ cemetery which is right by the coast path. It looked very well tended and as well as including well-loved cats and dogs, it also had a seal, a puffin and a shark. Portknockie. ‘Hello’ to all your children Val. 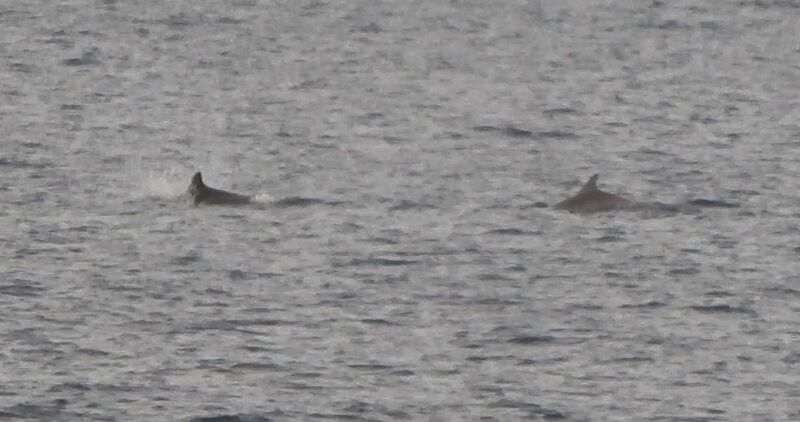 Thanks you our Portknockie experience we were able to spot more dolphins further along and also some Atlantic grey seals at Craigenroan rocks just east of Buckie. We met some more lovely people as the week went on Hi to all of you: Terryl and Rod doing some ancestor hunting at Findochty, Barry at the Kingston Nature Reserve, Grant working for Stagecoach buses in Elgin, Carole Ann at Hopeman, Harry and Liz on holiday at Lossiemouth and Doreen at the Information centre at Burghead. What a great place to visit and a very friendly welcome there. 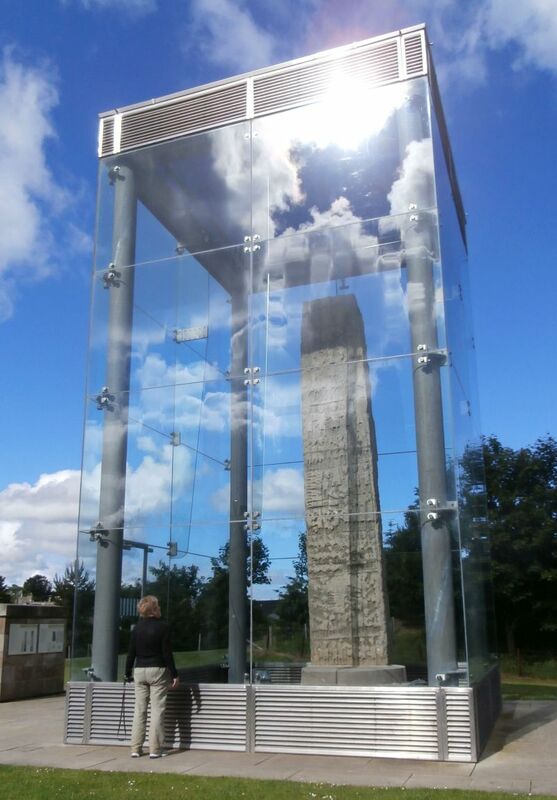 Just past the Information centre is a ‘dig’ for Pictish and Saxon remains. Post-holes and an Alfred the Great coin discovered there. 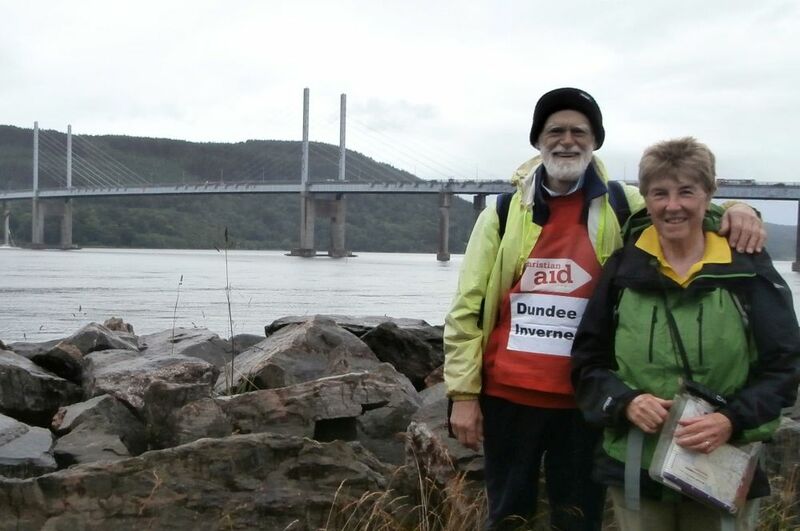 Less than a week to go and about 40 miles to walk to the Kessock Bridge! At last the rain has stopped and the wind has swung away from the north. This last week saw us pass the half way point on the walk and also ‘turn the corner’ so that we walk now east to west instead of south to north. Last Sunday saw us have a great welcome at the church nearest to where we were staying – that of St Drostan in New Aberdour. The owner (thank you Graeme) of our self catering cottage is an elder there and had prepared the way for us to speak. Most enthusiastic were two ladies from West Yorkshire who had taken up residence here but missed Christian Aid. The Scots were pretty good too. 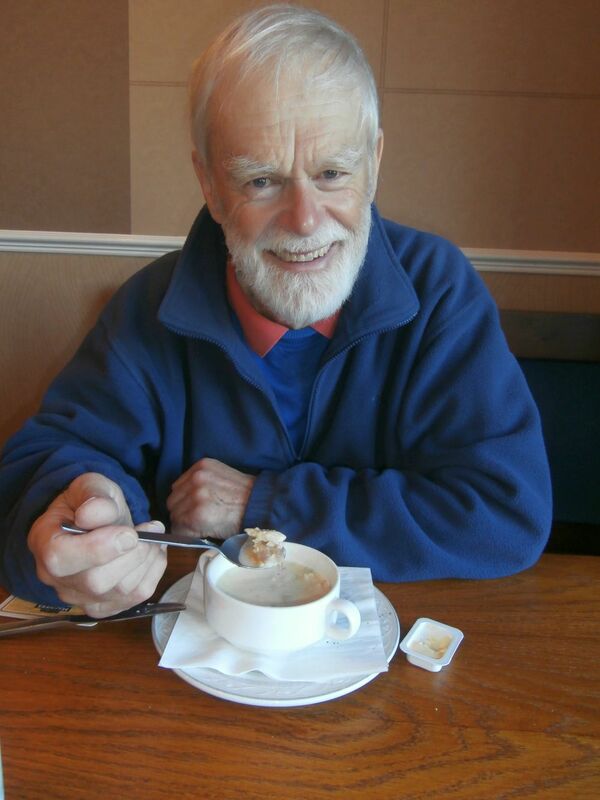 Thank you for your welcome Richard and all the saints in New Aberdour. After the service (which featured God telling Elijah to make sure he had enough rest – a word for us?) we drove down to see the ‘Auld Kirk’, and St Drostan’s well which is on New Aberdour’s beach. St Drostan was a nephew of St Columba and apparently came to Scotland from Ireland with him. 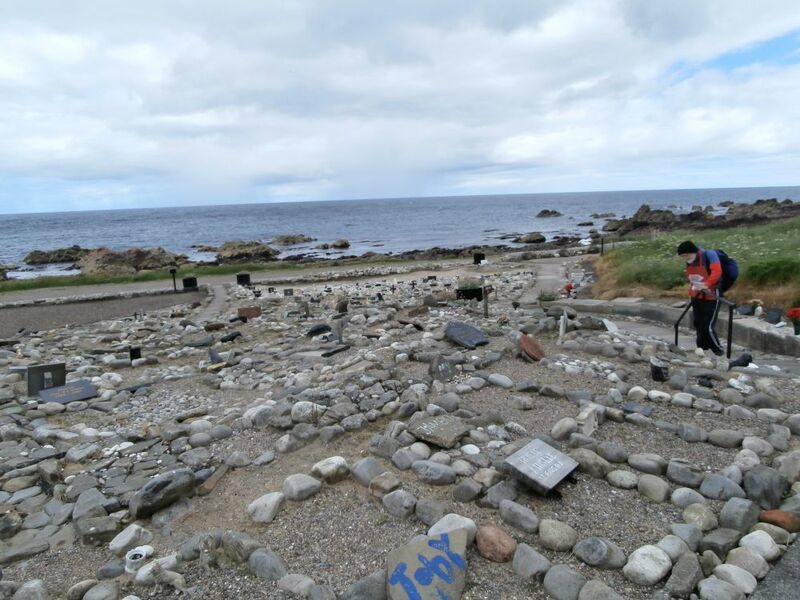 St Columba came ashore at this beach and received a friendly welcome from the Picts and so left Drostan to preach the Gospel and do the first baptisms on Scottish soil from the well – maybe that should be Pictish soil? The castles seemed to adorn every headland and sometimes a little further inland too. 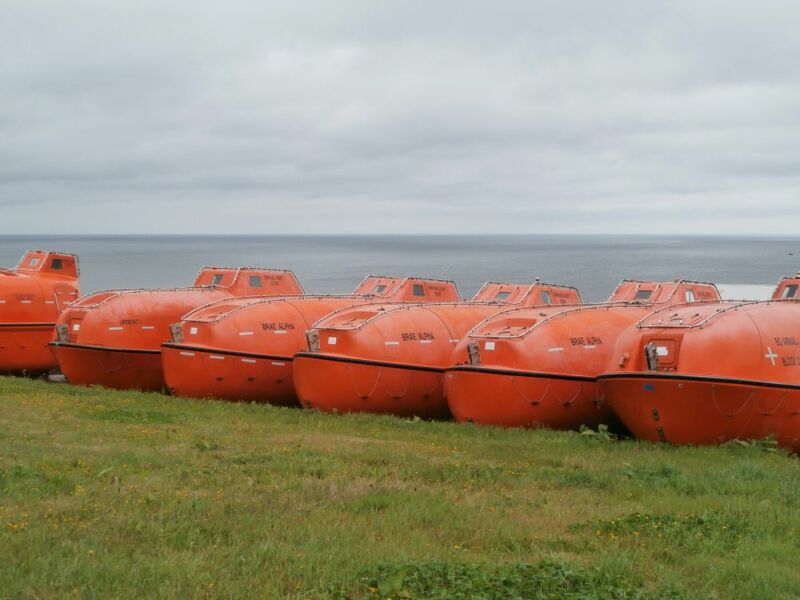 The most striking story is the one attached to Slains castle. This was in existence near the village of Slains just on the headland in a prominent place. The laird of the castle took part in a failed rebellion against King James IV and as a punishment had his castle blown up. 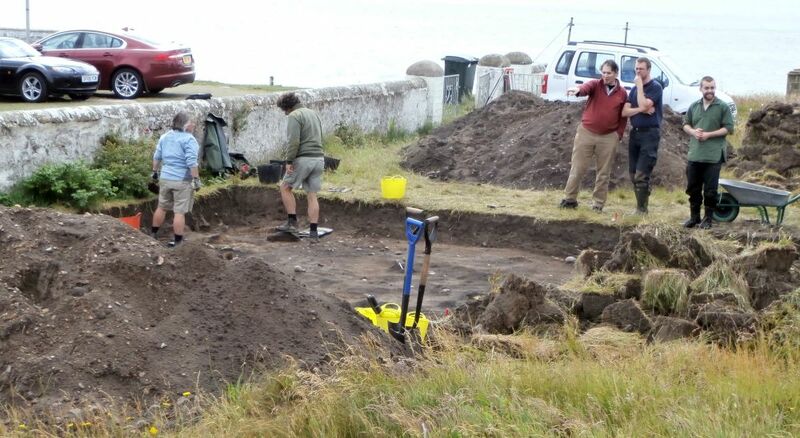 When the Laird was in a position to rebuild, an easier site for him was several miles further north near Cruden Bay. But he kept the name of Slains Castle. Both are now in ruins but the ‘new’ castle captured the imagination of Bram Stoker when he visited and he used it as the setting for Count Dracula’s castle. The locals (so we were told) now call it Dracula’s castle. We have walked through plenty of fishing villages, but the biggest fish port we walked through was Fraserburgh. Whilst passing through the fish docks we saw a vessel winding out its nets which had pieces of fish caught in the mesh. The gulls were having a right tug of war over the scraps until one large black backed gull came and sorted the others out. Fraserburgh was also the place I managed to get my hair cut at the Infinity salon (thank you Charlie) and the place for re-stocking the food supplies. We have met some great people this week. Hi to everyone at St Drostan’s, to Joy met on the dunes near Forvie nature reserve, to Bill the artist met at Cruden Bay bus stop, to Suzanne on the dunes with her dog near St Fergus, Gordon whom we met near Peterhead prison, Tony who is doing a wonderful walk for charity around the coast of Great Britain (and was walking with the sea on his left), Mary in Pittulie rather early in the morning and Bill and Dennis walking thier dog on Rosehearty beach – thanks for the tip about the route, we found the tower, the white shed and saw seals! This last week has certainly scotched the idea that Nancy and John always get nice weather for their walks. We have managed to see the sun just two days out of our 9 days of walks, since we started nearly two weeks ago. The rain, cold and strong northerly winds means that we have met few people on our walks and the ones we have seen have been like us muffled up and not wanting to stop and talk. 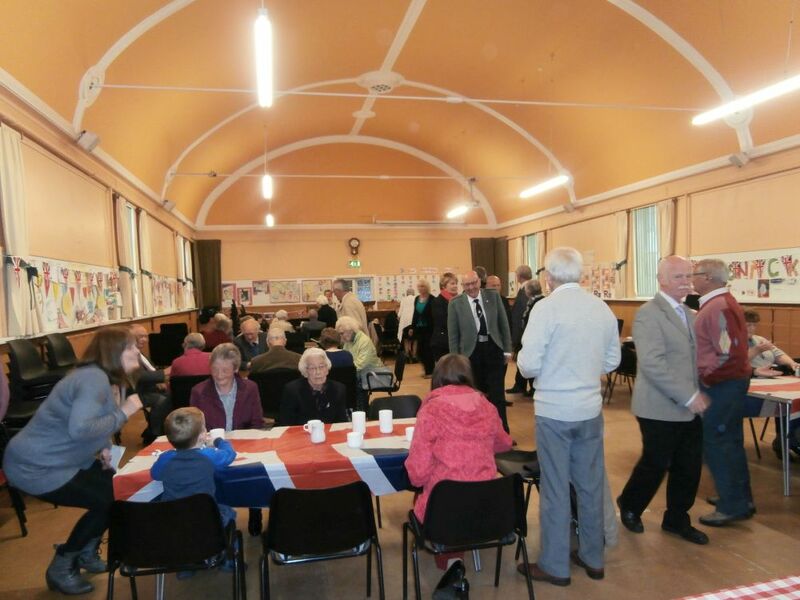 However, there was plenty of conversation at Forfar East and Old Parish Church where we went last Sunday. 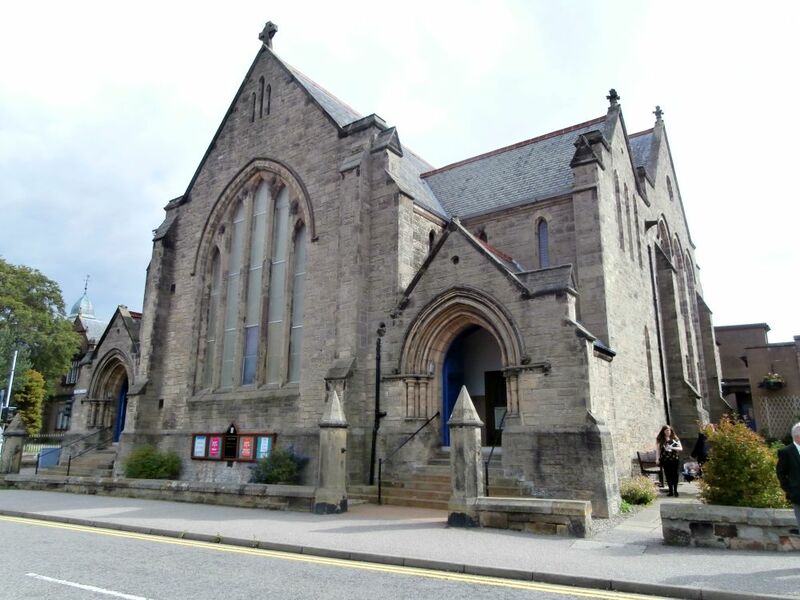 Revd Barbara Sweetin had invited us to give a brief talk to the congregation about the Ethiopian project we were supporting and also a kind invitation to join church members for their Queen’s birthday lunch. This was delicious and we both thoroughly enjoyed ourselves and church members were most generous – thank you! We have still managed to admire the rugged coastline and the sandy beaches. 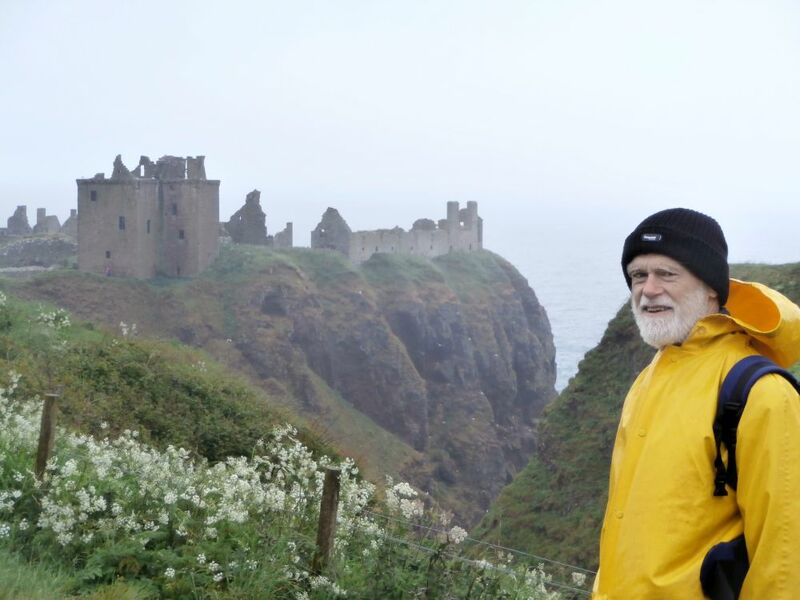 We saw St Cyrus in the sun and then saw Dunottar castle in the rain and the impressive war memorial erected by the people of Stonehaven (birthplace of R.W. Thomson the inventor of the pneumatic tyre) which boasts an open air swimming pool. Sadly the weather decided we did not try it out to see if its 29̊̊° C boast about the water temperature was correct. 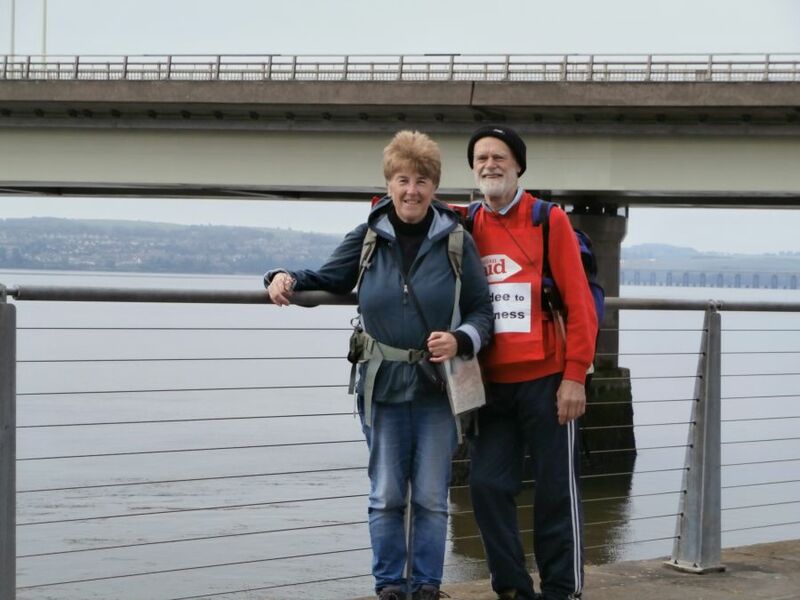 We set off last Monday from Dundee and found the Tay Bridge fairly easily, which was where we were starting the walk. 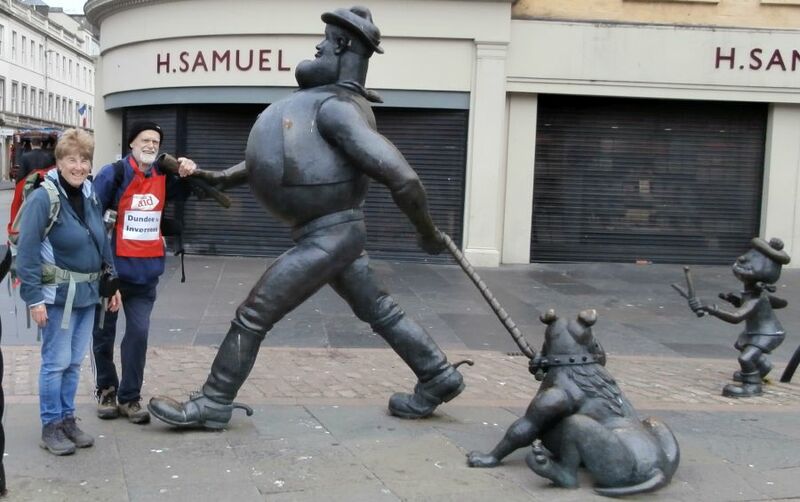 On the way there we came across Desperate Dan. Dundee was famous for jute, jam and journalism. We saw no jute or jam but as the Beano had been produced in the town we were pleased to find the characters on a notice board and the sculpted Dan character. The first morning was grey with sea fret but fairly soon started to brighten up so we managed the majority of the walk along the north Tay bank in glorious sunshine. Several people stopped us to ask what we were doing. Day two was grey for all of the walk. 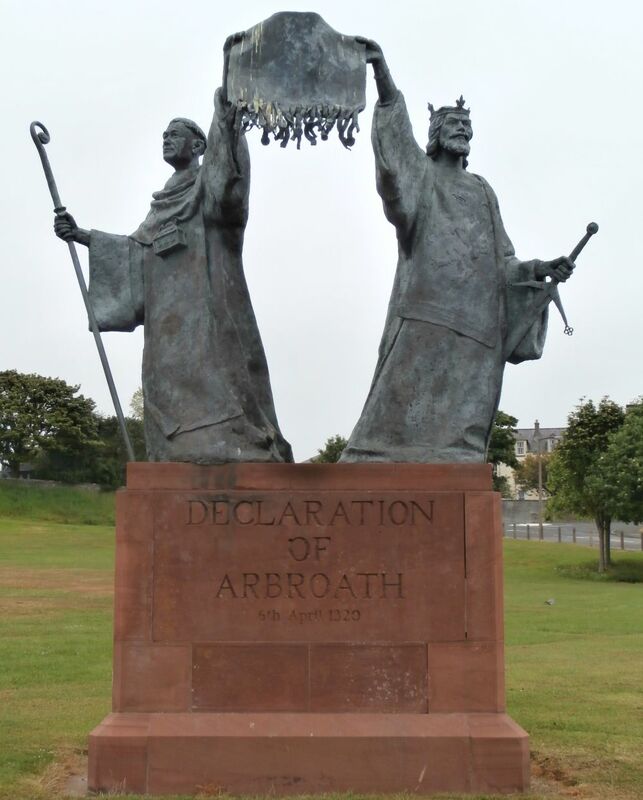 It was a shorter distance so we had a chance to look around Arbroath and check out the Arbroath Declaration. This was signed on 6th April 1320 at Arbroath Abbey and is hailed as the start of Scotland as a nation with the right to determine its own future. This document was used as the template for the American Declaration of Independence. We also visited a smoke house and bought a couple of smokies for our tea. They have a lot of bones! The coastline after Arbroath is sculptured by the weather and sea. The rock is old red sandstone and it has been eroded into stacks, caves, deep inlets and blow holes. John wanted many photographs as he was in his ‘geography teacher’ mode. 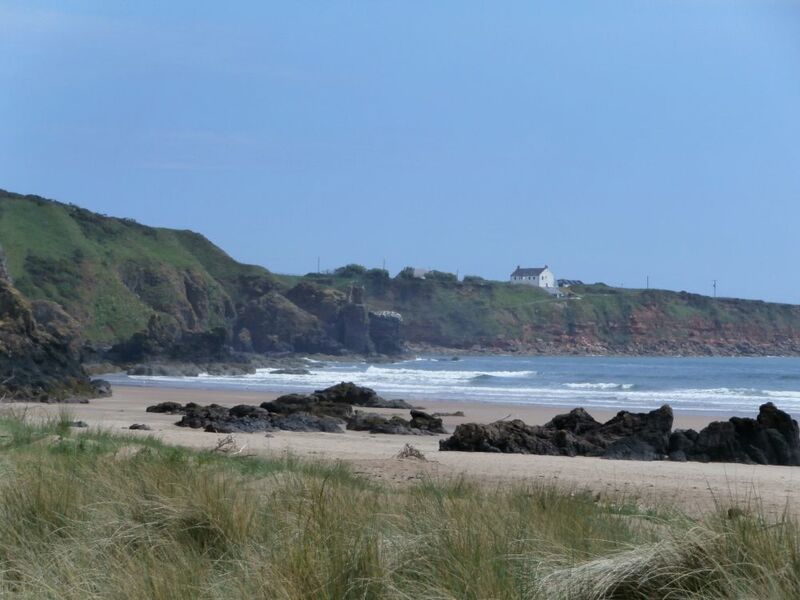 After the cliffs is a lovely sandy bay called Lunan Bay. This is apparently where the Dundee-onians come to relax (when the weather is warm). 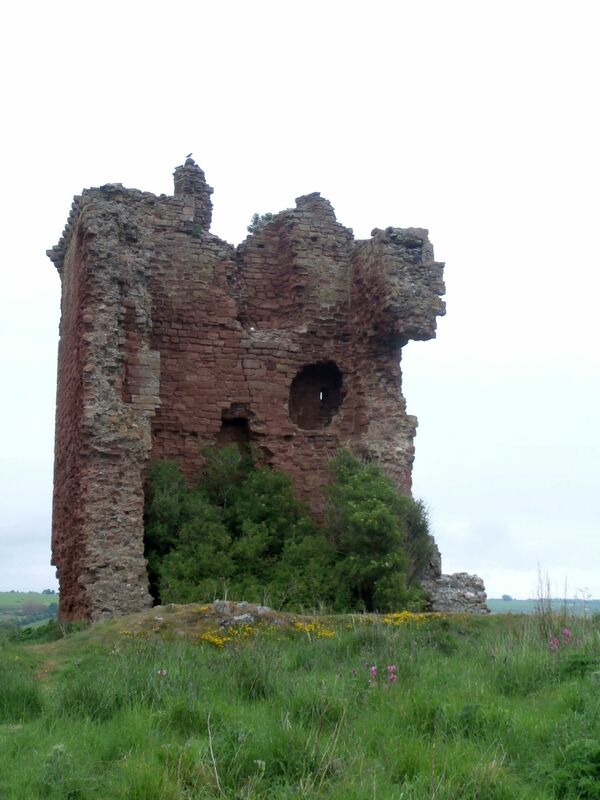 It was almost deserted as we walked along to reach Lunan Castle – well the remains of it. Hello to Laurie Bidwell (Dundee City Council), David – good luck on your ‘Dundee to Aberdeen’ walk at the start of the football season, Paula recovering from a broken bone in the foot met at Broughty Ferry, Claire and her spotty dogs who has walked the Camino, Kevin from Arbroath we met near the Abbey and Brian the farmer from Mains of Usan who gave us a lot of information about cows, salmon and barley. Dundee cake couldn’t be found – even for ready money. Author NancyPosted on June 11, 2016 January 20, 2017 Categories Firth to FirthLeave a comment on Off at last! We have been really encouraged by the amount of support we have received both locally where we live and also further afield. The sponsoring has been going really well which means we already have quite an amount on our Just Giving page and there is more promised. The weather in Scotland seems to have been a lot better than the weather at home so here’s hoping the walking will be blessed with dry going. John and I have also been sharpening up our Scrabble skills for the ‘Statistics’ part of the blog.